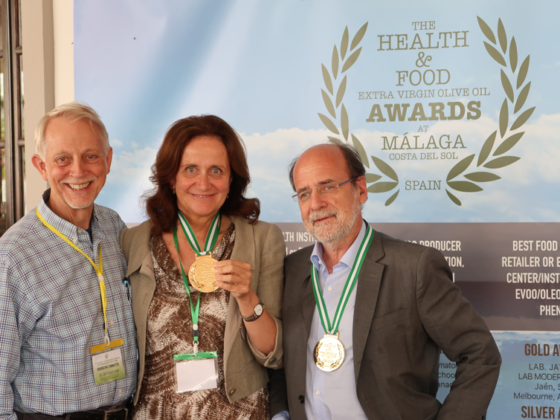 HEALTH MATTERS "LA SALUD IMPORTA"
With the attendance of over fifty experts, scientists, doctors, chefs, chemists, nutritionists, pharmacists and producers of EVOO from the United States, Greece, Italy, Australia and Spain, was closed on Saturday 27th May in the city of Málaga “Health Matters Convention” The last public event was the opening of the first restaurant in a City where it is cooked only with extra virgin olive oil. 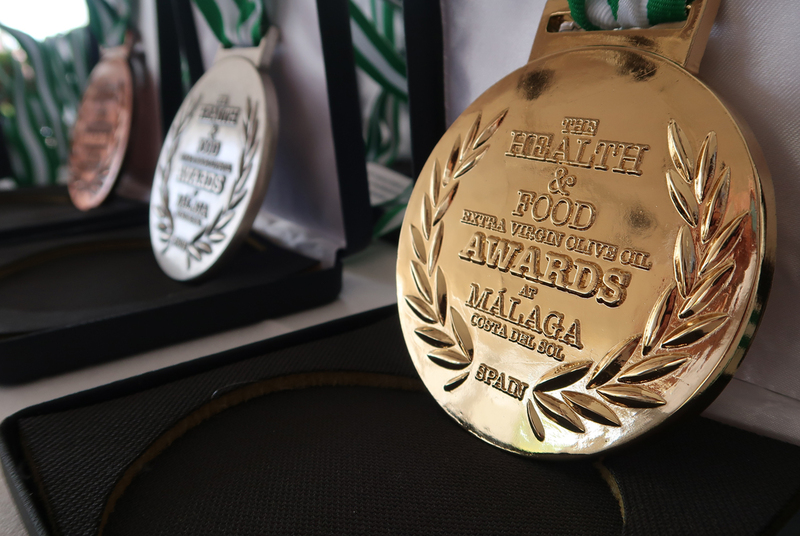 Prior to this inauguration were given the HEALTH & FOOD AWARDS Awards, which this year were awarded to more than thirty personalities and institutions in the field of Health, Gastronomy, Science and Extra Virgin Olive Oil. 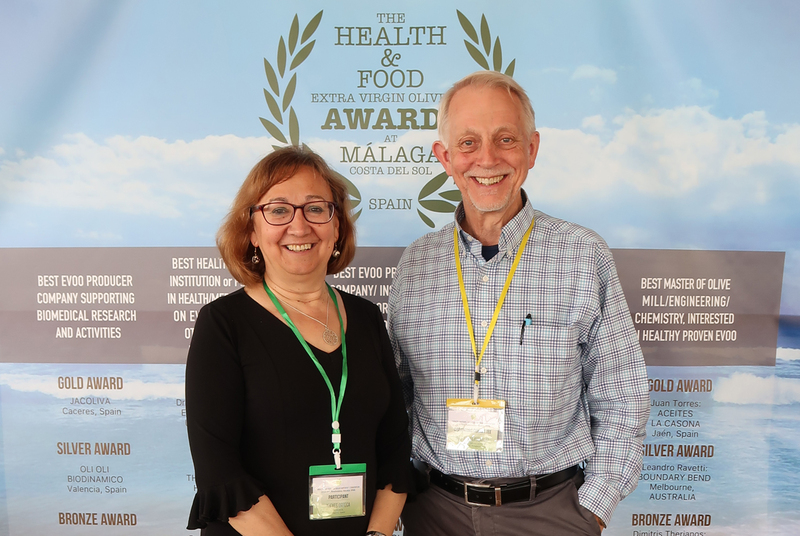 We highlight the one given to Professor Gary Beauchamp, from Philadelphia, USA, for his discovery of Oleocanthal, an anti-inflammatory similar to Ibuprofen that is created naturally during the malaxation period t of the olives that gives rise to EVOO. 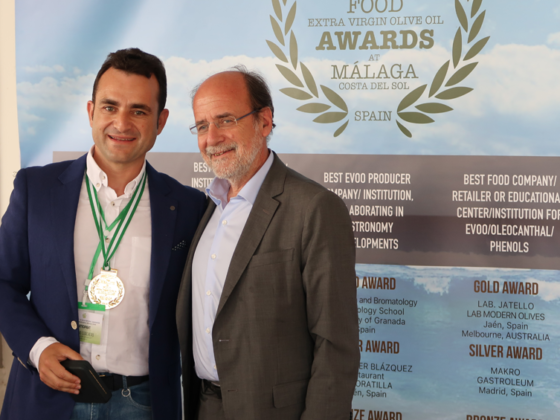 The Department of Bromatology of the University of Granada, the Master Mill of EVOO of Jaén, Juan Torres, the Directors of the prestigious PREDIMED study, Drs. 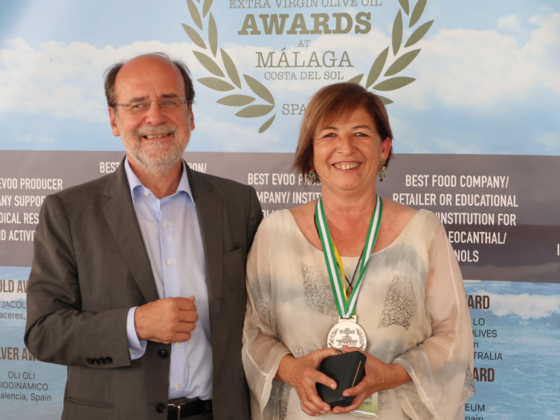 Ramón Estruch and Rosa Lamuela, JA TELLO Laboratories of Jaén and MODERN OLIVES of Melbourne and the company JACOLIVA of Cáceres took the AWARDS of Gold. 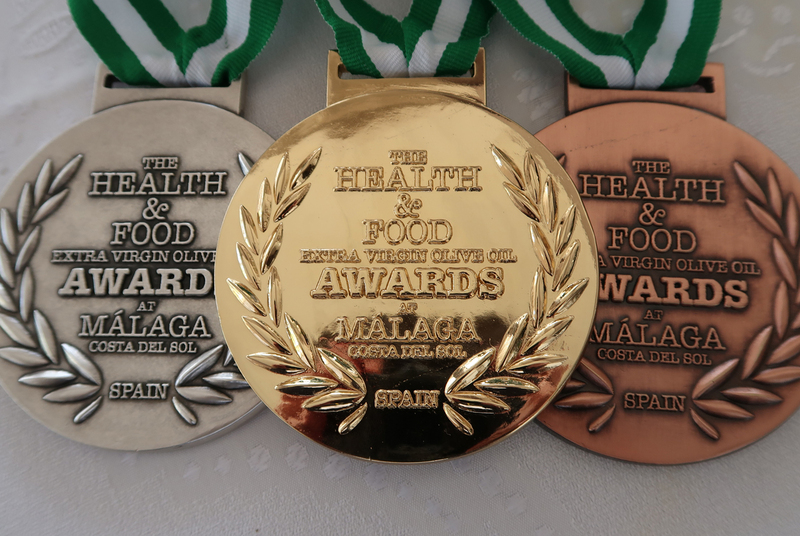 In SILVER, the Director of the Harvard University Firefighters Project, Dr Stefanos Kales, Oli Oli Biodinamico, Valencia, CHEF Javi Blázquez de Jaén, MAKRO-GASTROLEUM and the Argentine Agronomist, Leandro Ravetti from Australia. 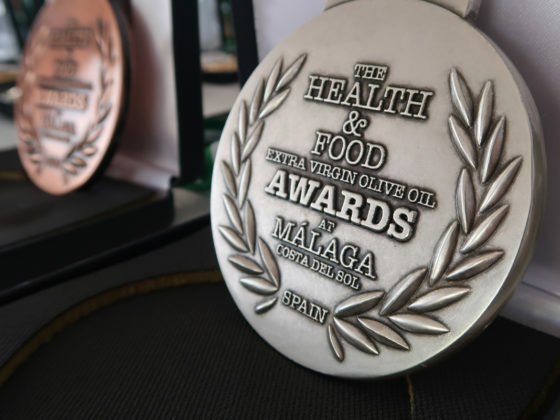 The BRONZE medals were for the Greek Producer Dimitris Therianos, the prestigious OLIMERCA Magazine, the OLIVE Restaurants of Torrevieja and MAROLEUM of Málaga, La Casona from Jaén, and Researcher Oreste Gualillo of the Xergas in Galicia. 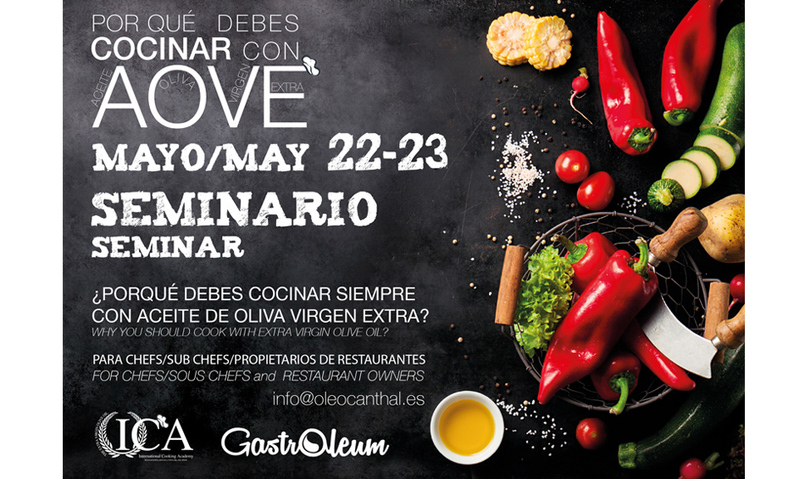 The Convention opened with the Seminar “Why you should always cook with EXTRA VIRGIN OLIVE OIL”, addressed to CHEFS and owners of Restaurants. 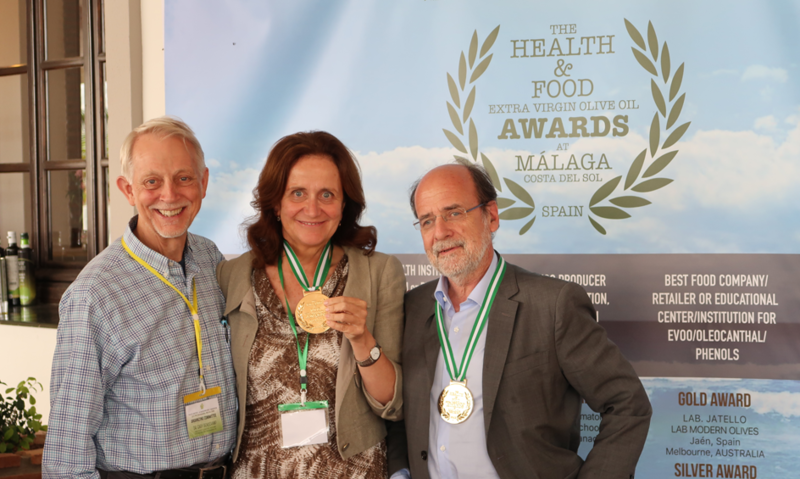 Dr. Velasco of the Institute of Fats of the CSIC in Seville, who spoke on fried foods with EVOO, Dr. Javier Bermúdez of the IBIMA in Málaga who spoke on healthy fats, Prof. Javier Quesada of the Faculty Pharmacology-Bromatology of the University of Granada that exposed the health of the Phenols, Dr. Julia Warnberg, Faculty of Medicine of the University of Málaga and in charge of the study PREDIMED in the province, the CHEF, Firo Vázquez who spoke on the GASTROLEUM application and CHEF Daniel Garcia Peinado from MAROLEUM, who talked about the cooking techniques of the EVOO in kitchen. 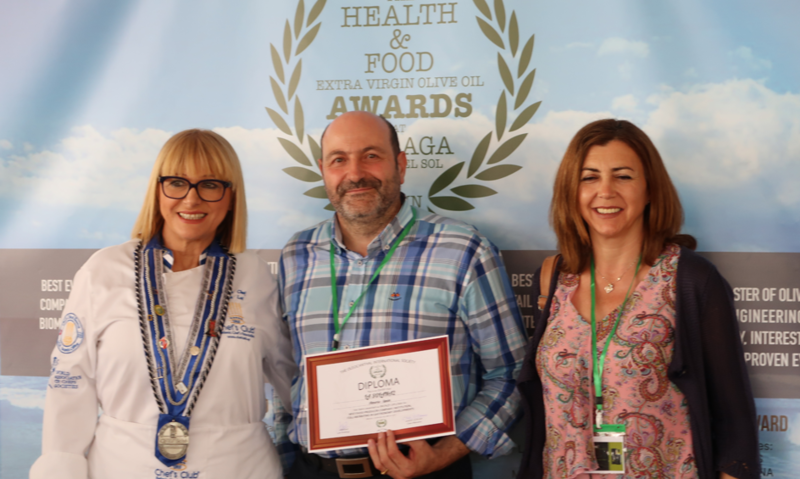 Dr. Jose Amérigo, who lectured on THE COOKING Program, Teaching Healthy EVOO, together with the food technologist, Ascensión Rueda, and Dra. Nutricionist, Mary Flynn, from Brown University, USA, that speaks about her clinic experience in patients about how to cook with EVOO and the Mediterranean Diet. 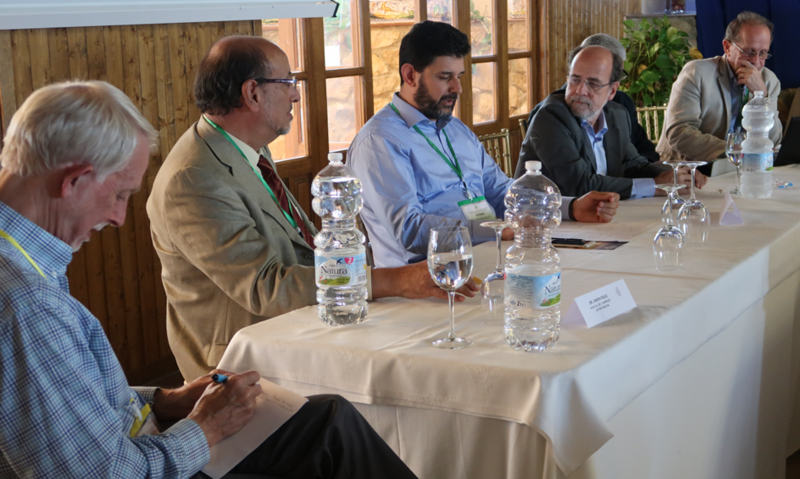 An advanced program that was presented at the Seminar and that had its expression in the five-day meals that lasted the Convention. 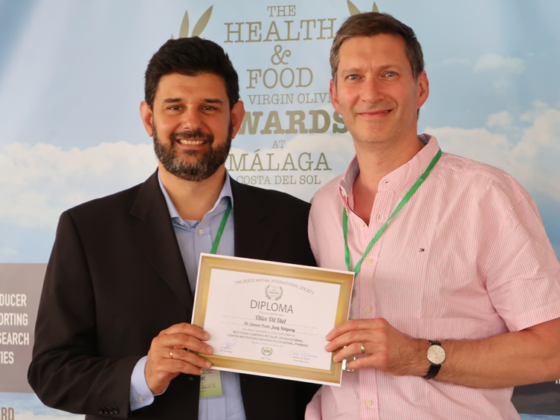 “Teaching Healthy EVOO Cooking” Teaching Cooking with healthy EVOO. 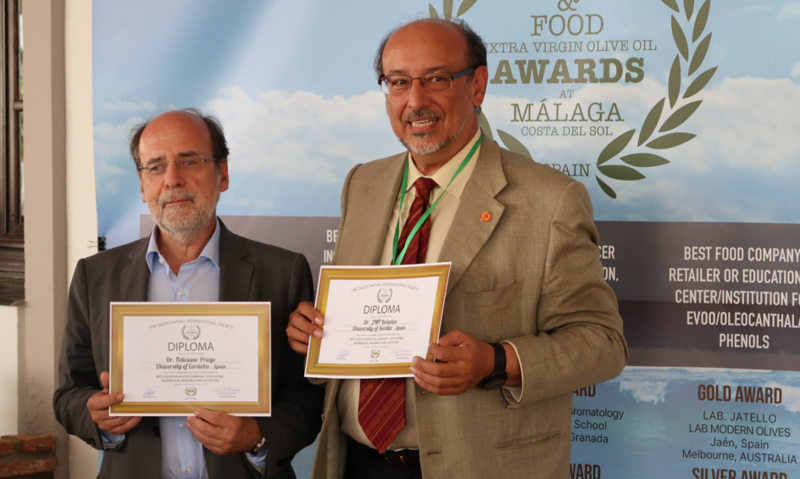 From the technical hand of Dr.Amérigo and the Food Technologist Ascensión Rueda and from the practice in Cooking of the young CHEF Javi Blázquez, it is tried to start in the Restaurants that adhere to the International Cooking Academy with EVOO. 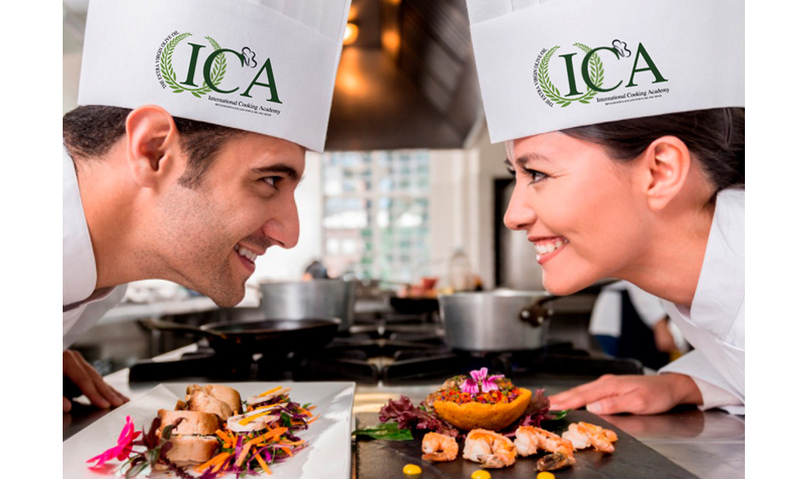 EVOO-ICA, some protocols for ingredients and form of cooking, which are then analyzed to know the final composition. 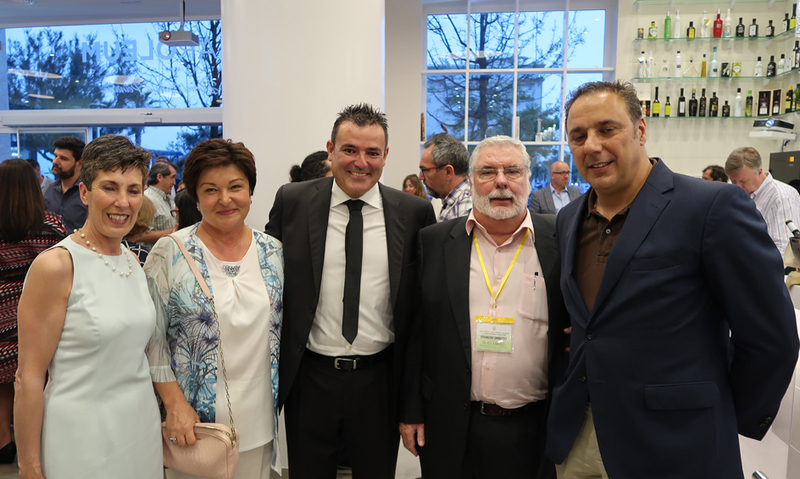 During the FIVE days of the Convention, the “Chef del Olivar” Javi Blázquez developed 5 traditional dishes, tortillas, fish, meats, garlic and rice, along with starters and desserts. 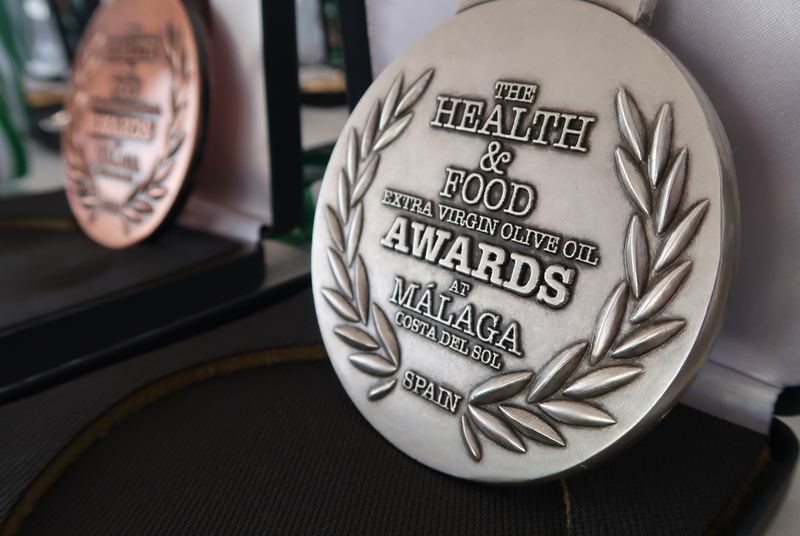 All of them made Exclusively with EVOO, different temperatures and forms of cooking. 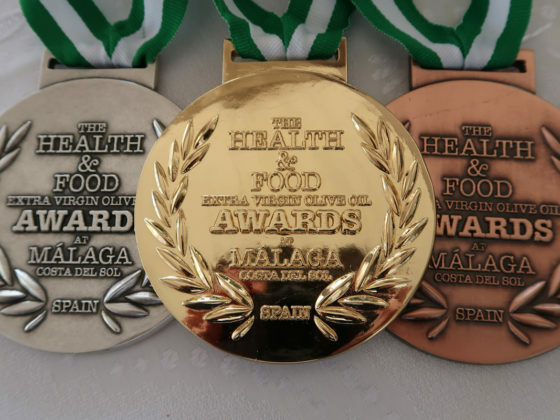 The originality in the presentations and its excellent preparation have made this young Chef of Villanueva del Arzobispo in Jaén, as a reality in the world of Healthy Cooking, a concept that will impose itself over time. 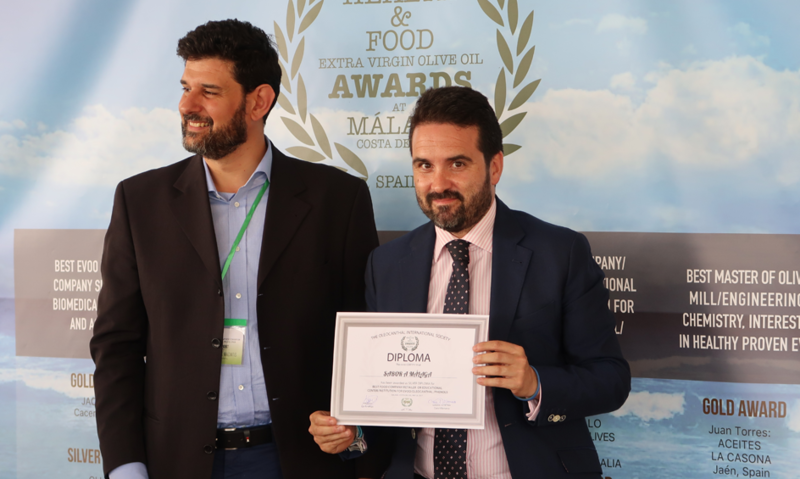 The first conference was chaired by CHEF Firo Vázquez who, after reviewing GASTROLEUM, the application of EVOO for mobile, stopped to outline GLOBAL GASTROLEUM a new application of an international character that is going to develop more to the measure of the customers. 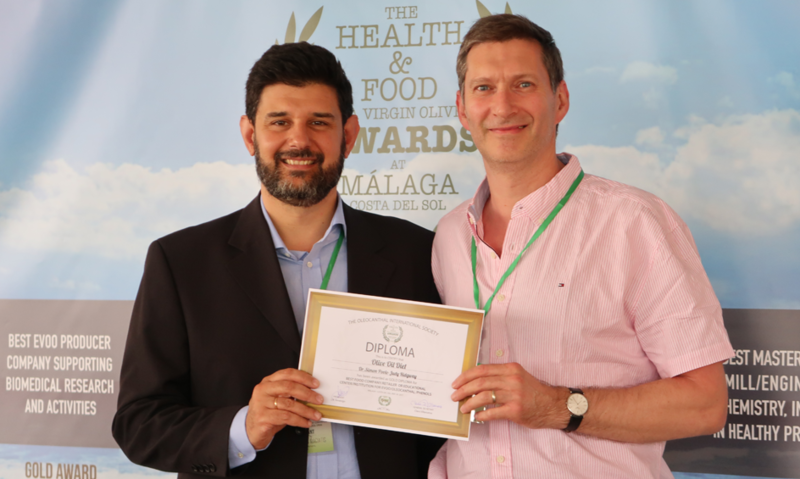 So that either personally or as part of a Corporate Group, you can access information, courses, training and practice on the EVOO and the Mediterranean Diet. Especially to develop in countries like United States or Japan. 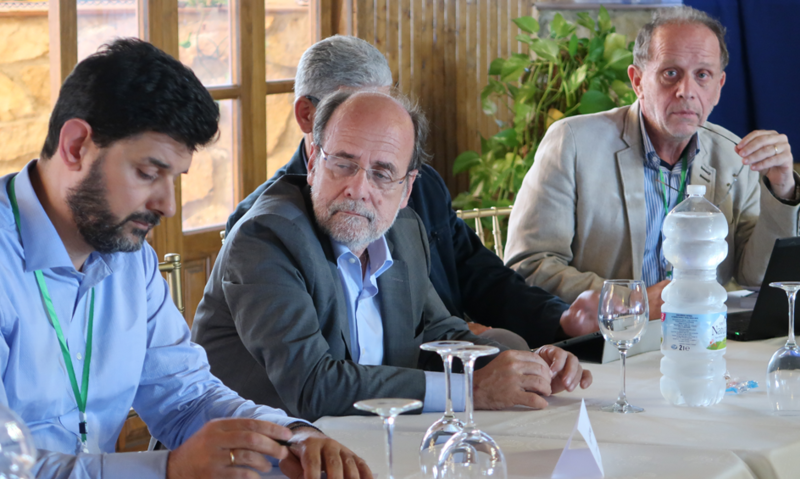 Jose Luis Bergillos, Vice-President of SAO-.AE, presented the ARISTOIL Project, aimed at Denominations of Origin, Mill Masters and Entrepreneurs. The European ARISTOIL project involving Greece, Italy, Croatia, Spain and Cyprus has three aims: 1) to develop the knowledge of Phenols as a differentiating element of OILS, with a stake Free for any producer who wants to know their levels of phenols, over the next three years. 2) Development of new rapid measurement techniques at the foot of Almazara. 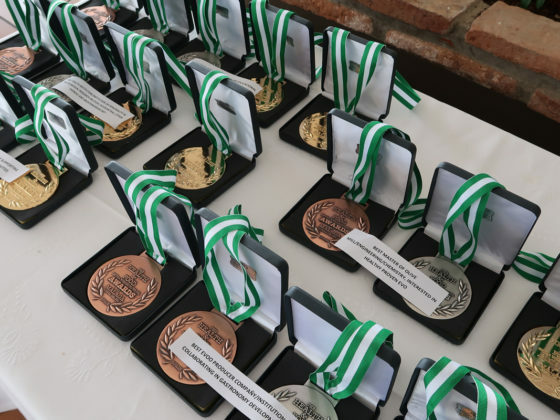 And 3) the implementation of a Seal of Accreditation. All this that SAO-AE has already launched in Spain. 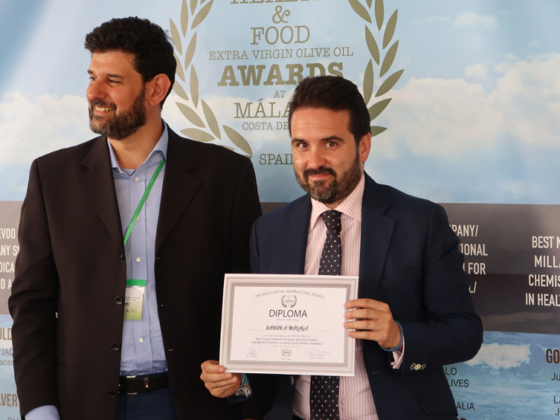 Dr.José Amérigo spoke of MARKETING, EVOO AND HEALTH, MAS HEALTH, a need for the Spanish Producers to direct their efforts to commercialize their EVOO with the Health flag and not as until now with the one of the “fruiting” of their olives juices. 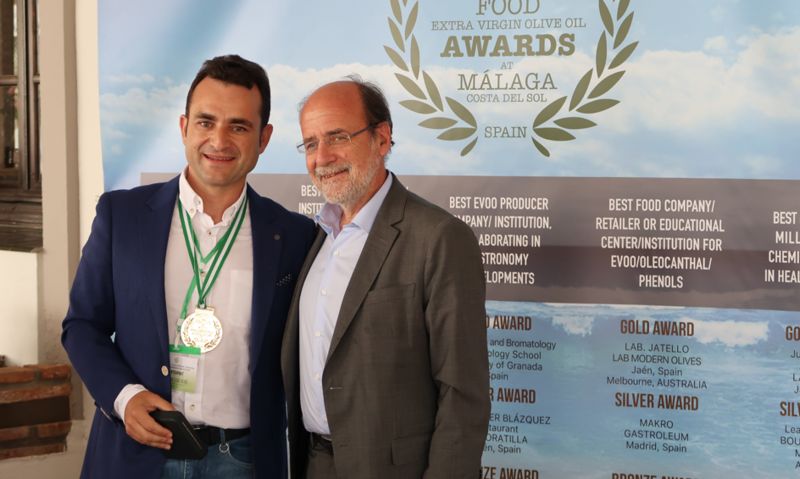 Dr. Amérigo warned that the only legend authorized in the bottles and by which the quality of EVOO will be known is due to the composition of fatty acids and phenols, authentic values for the health of Consumers. 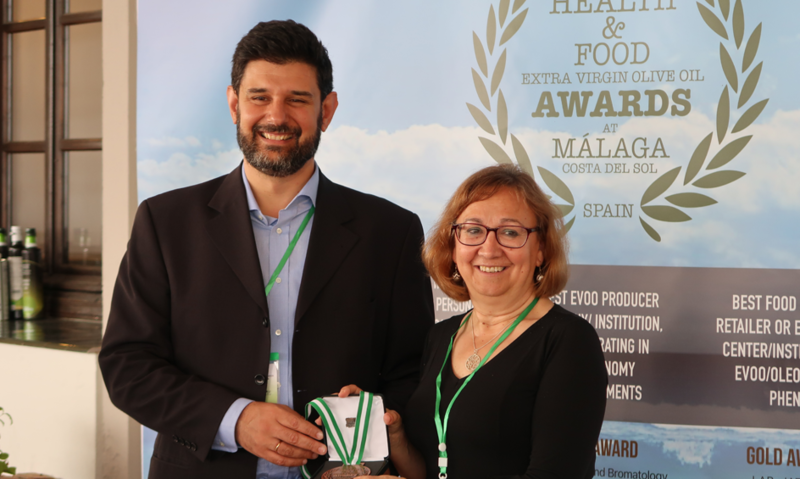 He insisted that the European Union is very clear when defining the health properties of the EVOO and that at no time should consumers buy EVOO for their amount or kind of volatiles but for their richness in natural chemical elements. Justino Corchero, CEO of MO, Manzanilla- Oleocanthal presented its star product, a new conception in the presentation and content of EVOO, “the luxury of nature” made with passion from the extraction of AOVE until its packaging and presentation, a form of To raise a very large commodity for the health of people, millennial and natural, even in its sustainability. 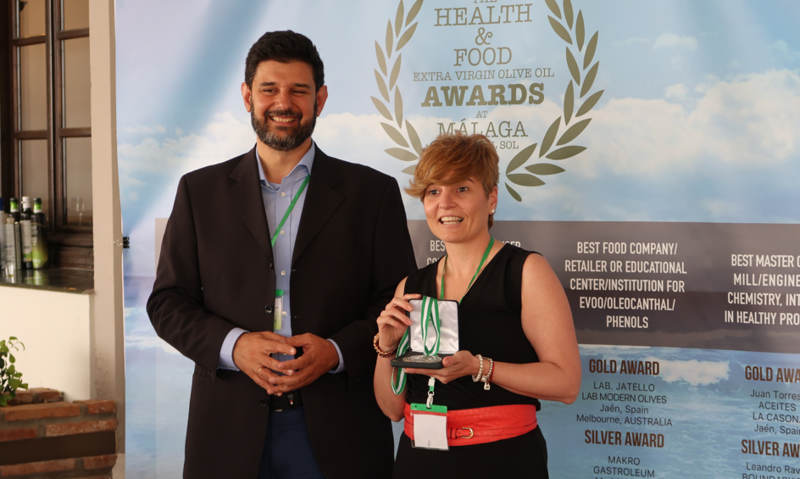 It was awarded with the most important award U.S. Green Mission of California, USA, winner of WORLD BEST HEALTHY EVOO CONTEST, 2017, followed by OLEOBERCHO and LA CASONA both from Jaén. 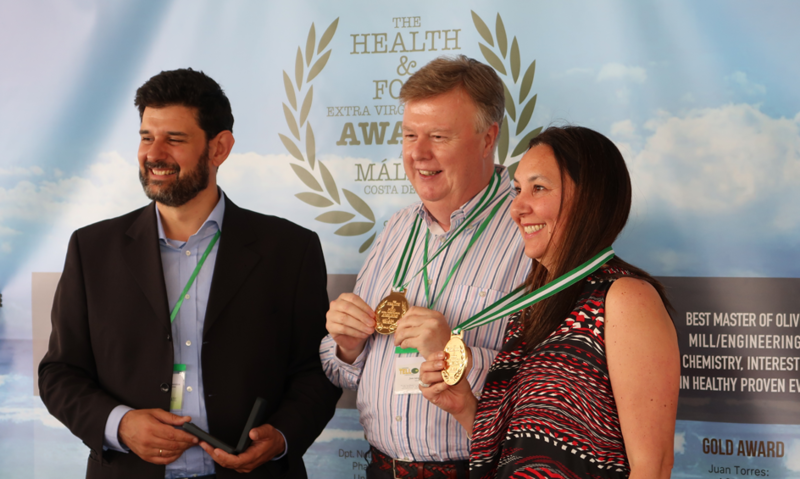 And three other EVOO from Greece, KASELL, THERIANOS and EIRINI PLOMARIOU as well as CASAS DE HUALDO, JACOLIVA, OLI OLI, LA ALQUERIA and LA SOLANA 2, among the top 10 in the world of a selection of 43 presented. 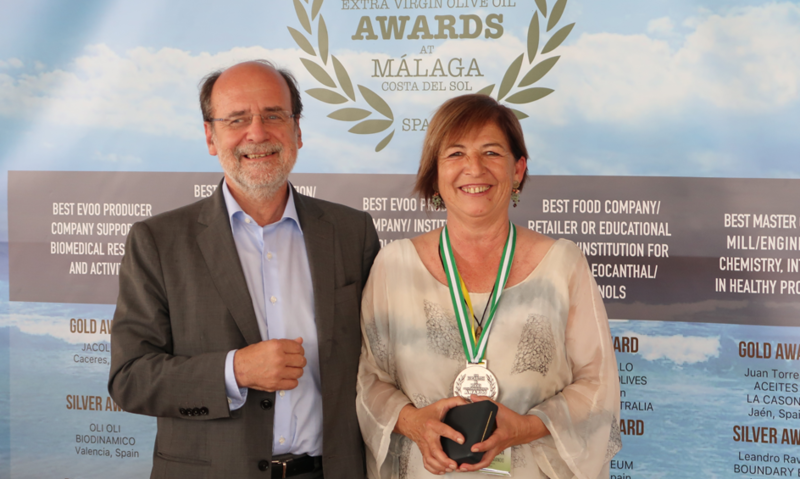 LA CASONA, from Jaén, won the GASTRINIMY CONTEST to the BEST WORLD HEALTHY EVOO for Cooking. 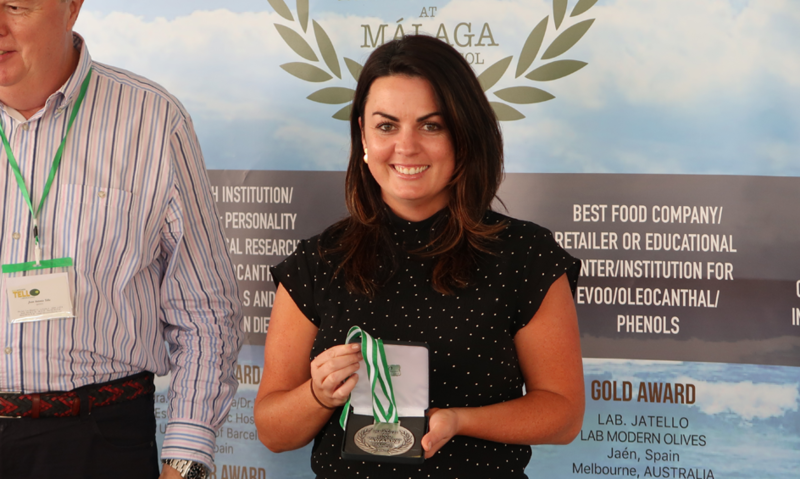 The final between the THREE winners of the WBHEC, US Green Mission, Oleobercho and La Casona, was decided by the JURY of five members, under the Presidency of New York CHEF Maria Loi, CHEF Javi Blázquez, cook two different plates with the three EVOOS and the final resulta was: LA CASONA, with 14 points, US Green Mission, 8 and Oleobercho, 7. 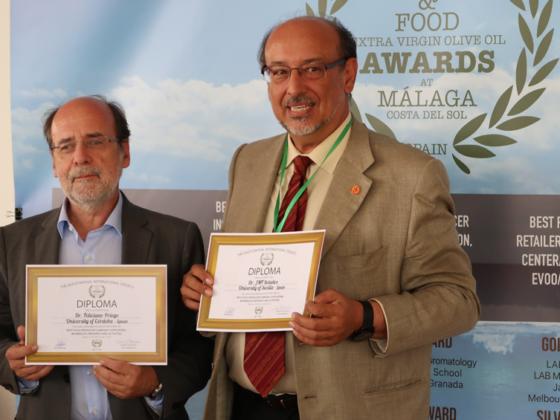 The WBHEC Prize Ceremony was the culmination of the first day of the Oleocanthal International Society where tackled such interesting topics as the Indiana Firefighters Project and other Corporate Groups in the United States, in which will be present commercially Spanish EVOO, based on its proven quality scientifically. 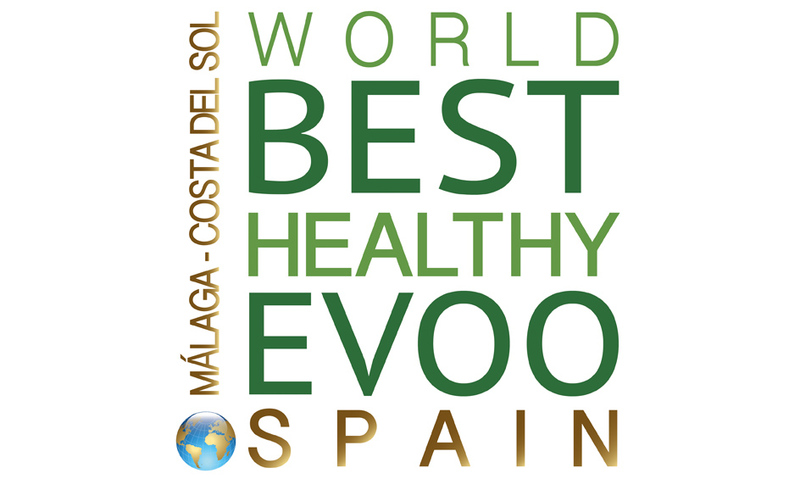 Clara Villanueva representative of SERENDIPITY WORLDWIDE in Spain, one of the entities that promotes the WORLD BEST HEALTHY EVOO CONTESTHead of the WORLD BEST HEALTHY CONTEST, has said that EVOO, participating in this Program will be distributed directly through a Direct Program whose center will be installed in Miami, Florida, USA. 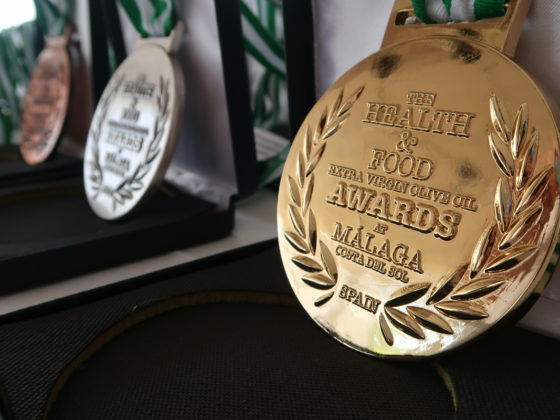 WORLD BEST HEALTHY EVOO for 2017 have already been called for a new Contest and the ceremony of delivery will be held in the United States in 2018. 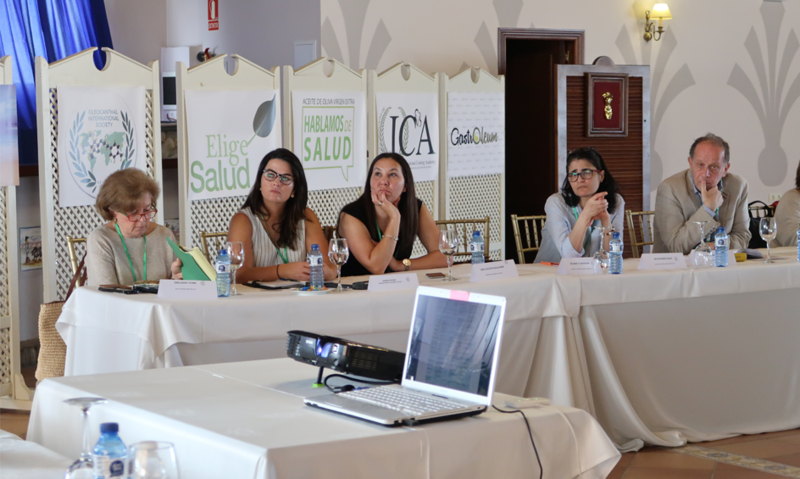 On Thursday 25, Dr. Javier Bermúdez from IBIMA, Carlos Haya Hospital in Málaga, presented the comparative study in prediabetic patients, fed with EVOO rich in Oleocanthal (+ – 500 mg / kg) and refined Olive Oil, in one Sample of 135 patients. 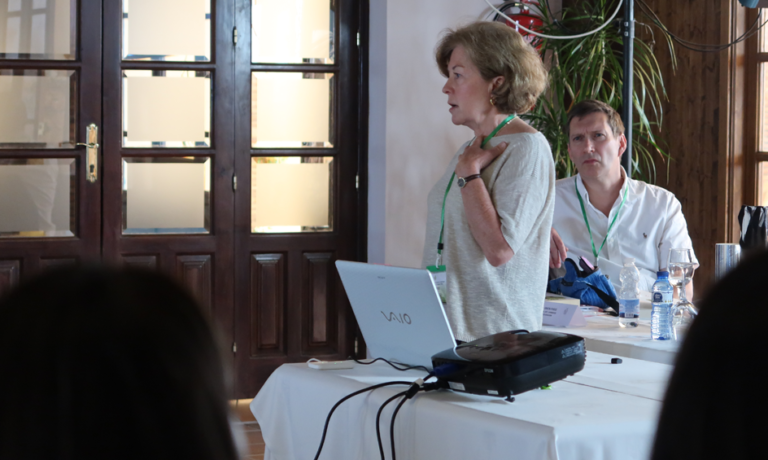 Dr. Mary Flynn of the Brown University of the USA, presented her experience mainly in cases of patients with breast cancer, Mediterranean Diet and EVOO. 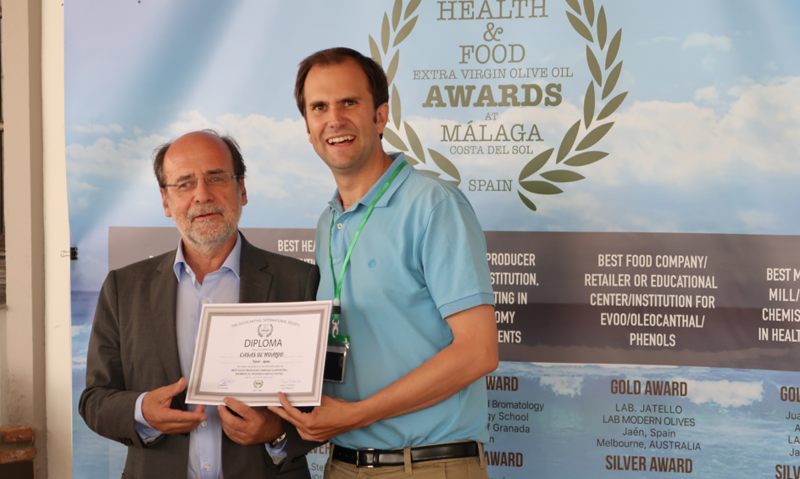 Dr. Peraba, from JA TELLO Laboratories, gave a presentation on the results of the World Healthy EVOO Contest, which yielded very significant results in relation to the three healthy lines: 1) Balance between unsaturated and saturated fatty acids (Close to 1,000 mg / kg, is ideal) and 3) Total content in Oleocanthal, above 400 mg / kg, all in a proportion of 50 % -40% and 10%. 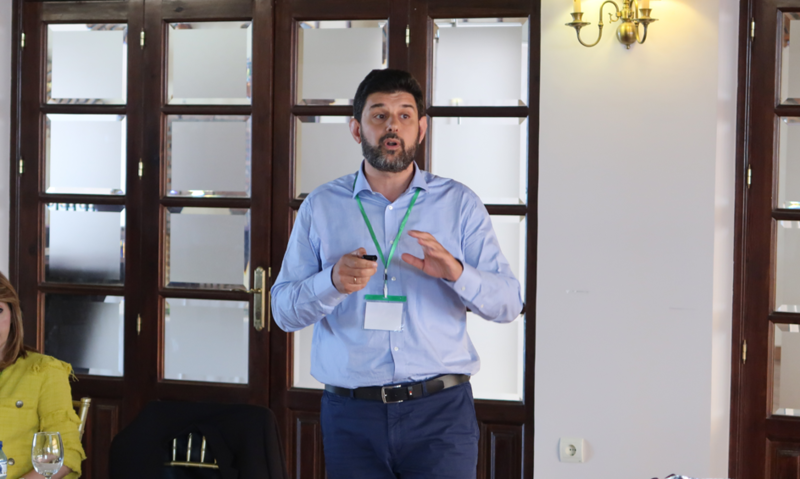 Prof. Prokopios Magiatis, from the University of Athens talked about new findings on oleocanthal chemistry, isolation, analysis and formulation of the 2016-2017 period, performed in the frame of the INTERREG MED program “ARISTOIL”. One of the most important findings was the discovery of an olive tree clone that can produce high amounts of oleocanthal giving unlimited access to oleocanthal (>90% purity) in only two extraction steps without need of chromatographic purification. 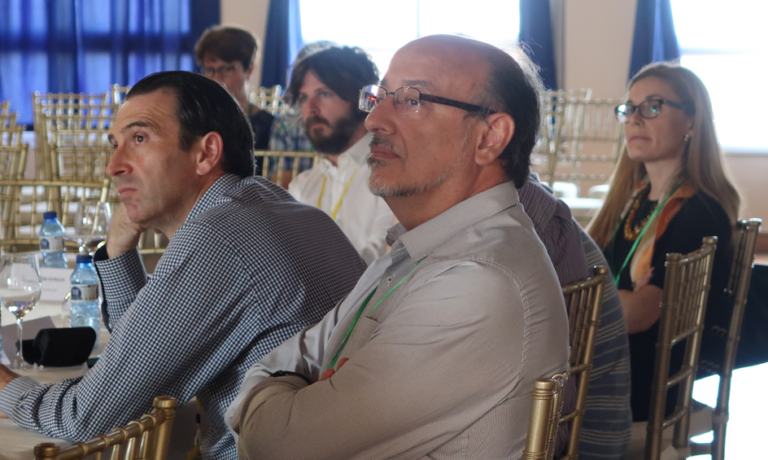 The oleocanthal produced by the new source was used in formulation studies and the first pharmaceutical forms of oleocanthal were presented: Tablets and capsules for internal use and liquid gel for external use. Stability studies of oleocanthal in liquid and solid forms showed that oleocanthal is stable enough to be used in pharmaceutical applications either in pure form or in the form of olive oil with naturally high levels of oleocanthal. 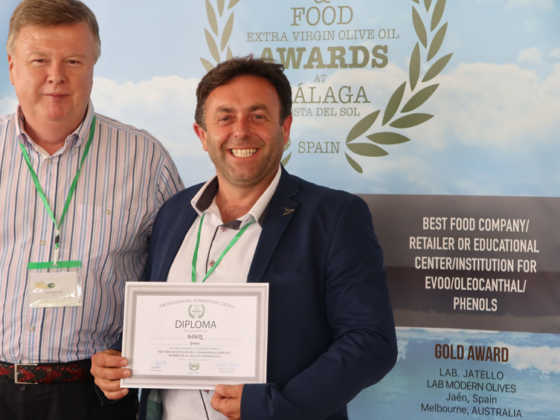 Interestingly the highest level of oleocanthal in olive oil at 2667 mg/Kg was identified this year in Cyprus. 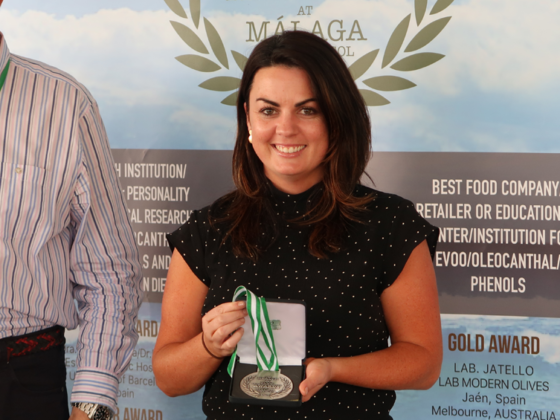 Magiatis also announced for the first time the discovery of a new oleocanthal derivative found in big quantities in olive oil that is a marker of exposure to high temperatures and aging of olive oil. 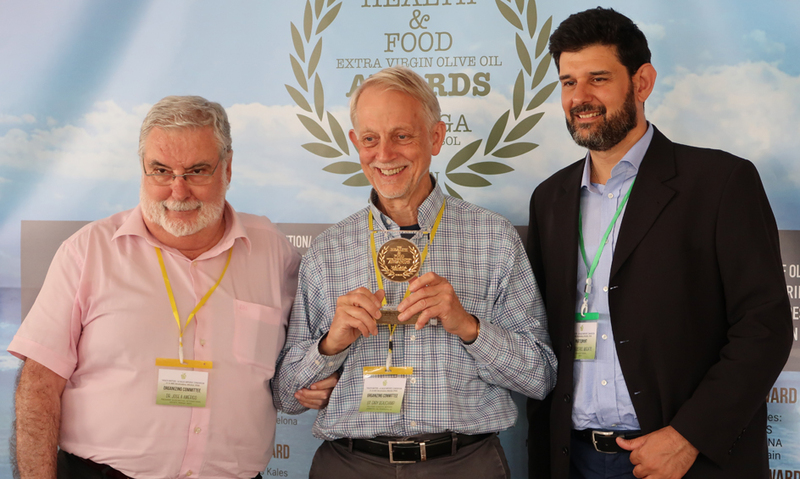 The new compound is an oxidation product of oleocanthal and interestingly cannot be always properly extracted from olive oil with the analysis method required by the International olive oil council for phenols, explaining why it had not been noticed earlier. The new compound was named oleocanthalic acid and has yet unknown taste and pharmacological properties. 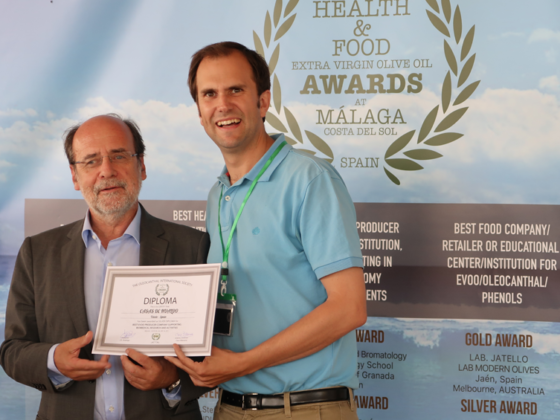 Finally discussed in details why the International Olive Oil Council method for phenols analysis by HPLC- UV or the widely used Folin-Ciocalteu method is underestimating the oleocanthal content and is not appropriate for the health claim certification of olive oil. New methods like the 1D and 2D quantitative nuclear magnetic resonance spectroscopy as well as the Melliou-Magiatis colorimetric reaction can be used to accurately measure the oleocanthal and oleacein content avoiding the problems of the old methods. 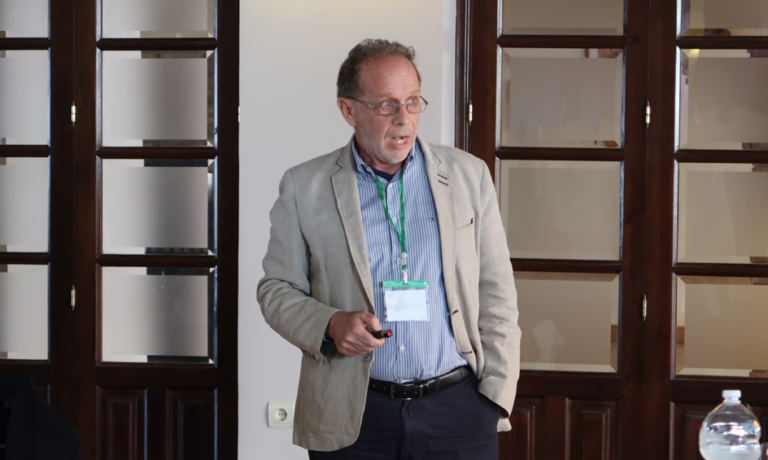 Interestingly the NMR methods, the colorimetric method as well as the LCMS methods are studied in the frame of the INTERREG MED program “ARISTOIL” in order to give the same results. 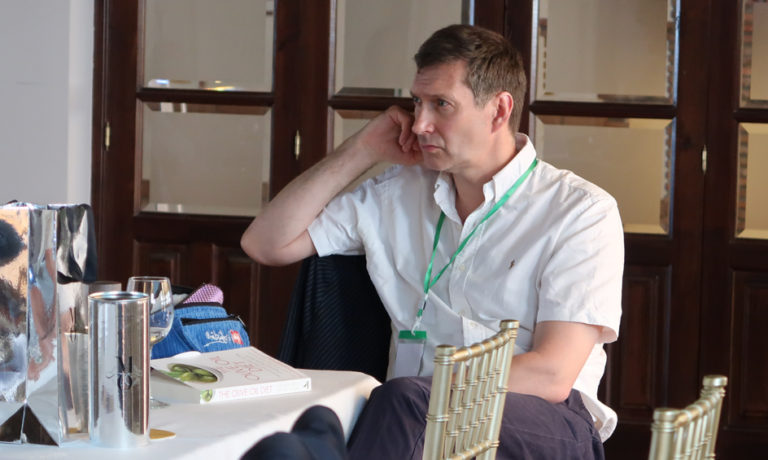 Dr. Simone Poole presented his book OLIVE OIL DIET, The Olive Oil Diet, with more than 140 recipes, in which the author tries to convince the British of the need and ease of changing their eating habits and embrace The AOVE as the basis for a new healthy cuisine in that country. 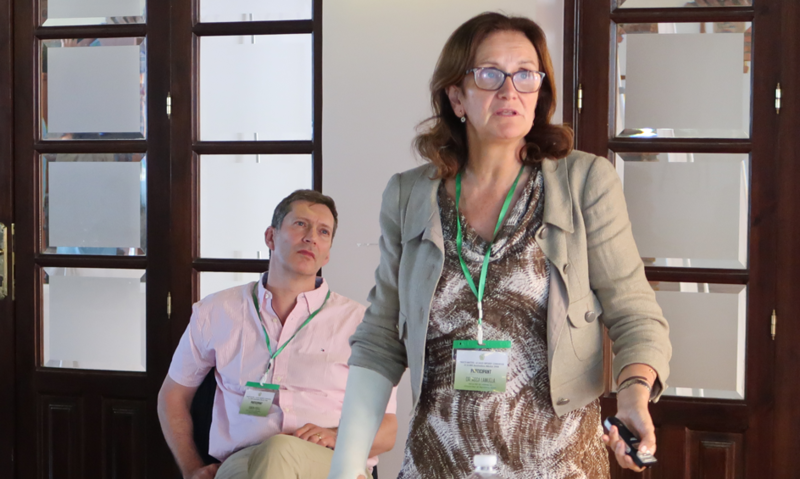 Dr. Amal Kaddoumi reviewed her work in demonstrating that Oleocanthal can be very active in Alzheimer’s disease and that the Oleocanthal contained in AOVE helps to remove abnormal proteins outside the brain. In vitro and in vitro studies Live have been shown to inhibit tau fibrillation by altering amyloid beta oligomyelinization. Dr.Stefanos Kales of Harvard University presented the study of INDIANA FIREFIGHTERS in the adoption of a new healthy diet that will prevent the onset of 38% of deaths from stroke, 22% from strokes and Rest due to metabolic and cardiovascular problems. Prof. Jose Maria F Bolaños of the University of Seville spoke about his advances in obtaining Oleocanthal in vitro in his Laboratory. 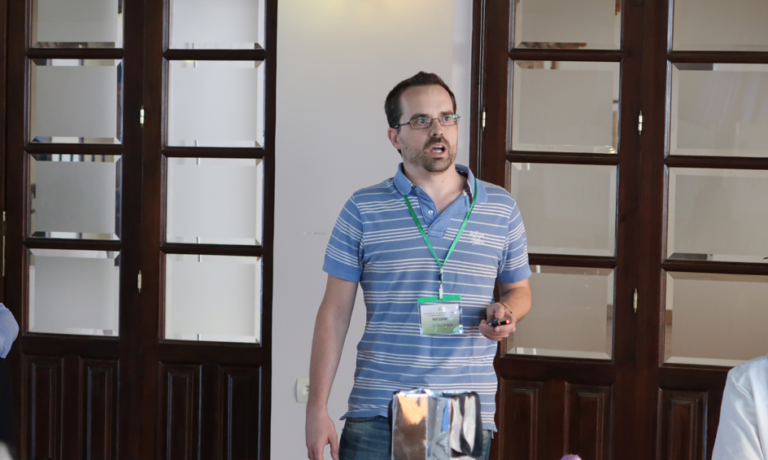 Dr. Leandros Skaltsounis from the University of Athens, Pharmacology School, explain the actual research that are doing in his Department concerning Oleocanthal and other Phenols as Hidroxitirosol. 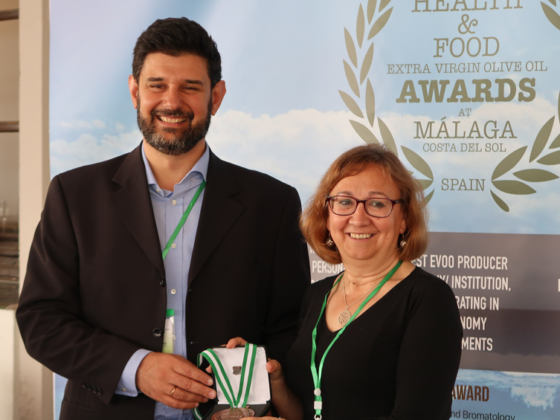 Dr. Feliciano Priego of the University of Córdoba spokes about the first analysis of the European Project ARISTOIL which aims to provide free incentives for the knowledge and benefits of the Phenols in the composition of the EVOO as a healthy part of them. 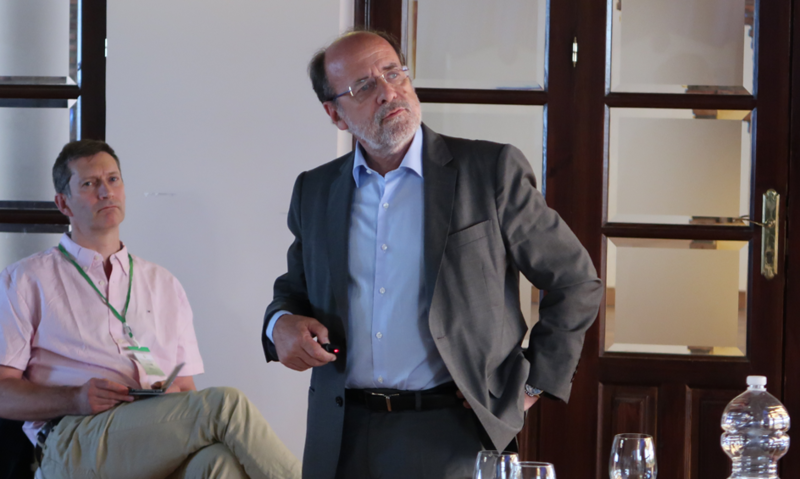 Dr. Oreste Gualillo from the Clinic Hospital Santiago de Compostela, speak of his continuous work on the effect of Oleocanthal in vitro on the rheumatoid processes perhaps. 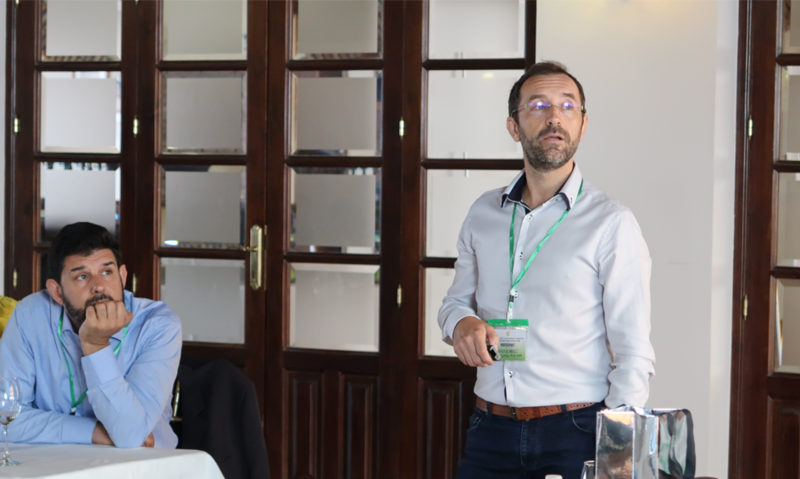 Dr. Ramon Estruch from the Clinic Hospital of Barcelona, PREDIMED STUDY reviewed the PREDIMED PLUS Project and announced his interest in research with Oleocanthal as an NSAID. 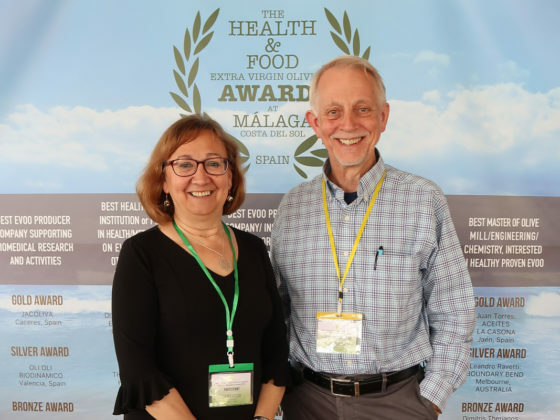 Dr. Rosa Lamuela presented the test that she and Dr. Estruch made to take pure Oleocanthal extract to see the metabolic of that molecule since until now it was not known what the metabolic pathways were in the human organism. Dra. 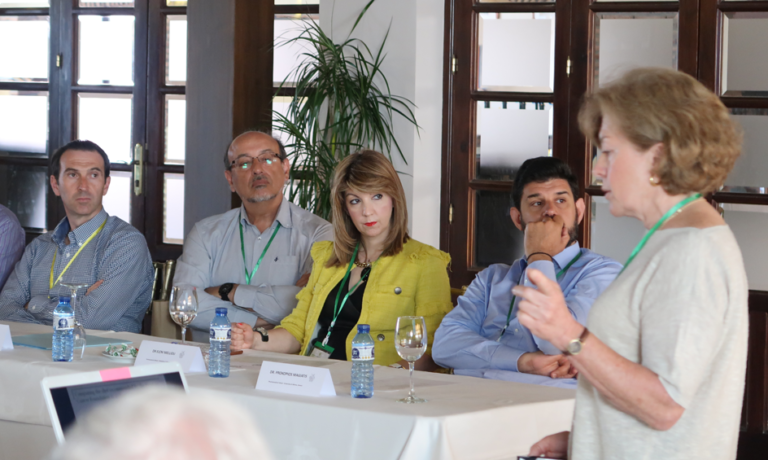 Claudia Guillaume report the studies that are being carried out in Australia on the EVOO, which are leading to the consideration that the important thing is NOT the SMOKE POINT, but the time and the temperature when cooking. 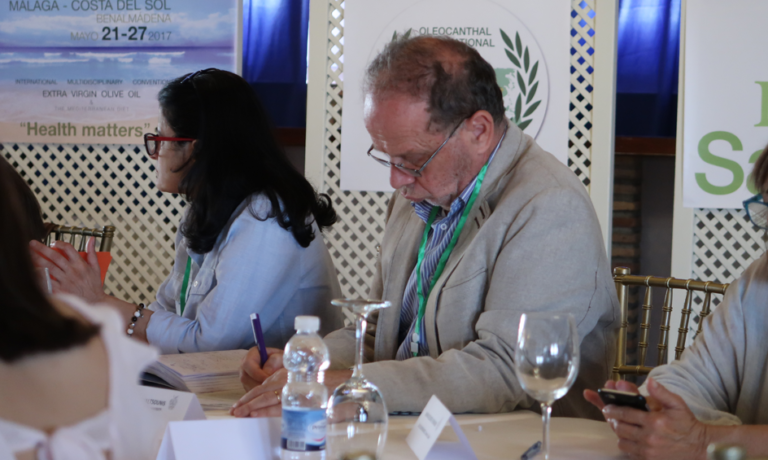 Dr. Gary Beauchamp before start the ROUND TABLE makes a Summary of the“Oleocanthal State of the Art” describing the THREE MAIN POINTS that all OIS activitiy is based. In the twelve years since oleocanthal (OC) was identified as a natural anti-inflammatory molecule (inhibitor of COX1 and COX2), a substantial number of studies, mainly using cell-based, in vitro procedures, have suggested that it could have efficacy in preventing or even treating many human maladies. 1. Nonsteroidal anti-inflammatory drugs (NSAIDs) provide pain-killing and fever-reducing effects, and, at higher doses, anti-inflammatory effects. Common NSAIDs include aspirin (only COX1 inhibition) and ibuprofen (COX1 and COX2 inhabition). How does OC differ from these other NSAIDs? What are the implications of these differences? 2. 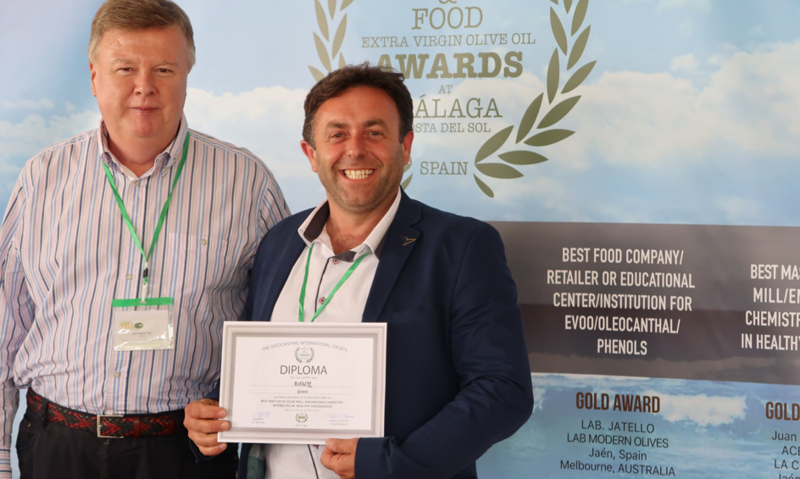 To what degree is OC different than other phenolic compounds found in extra virgin olive oil (EVOO)? 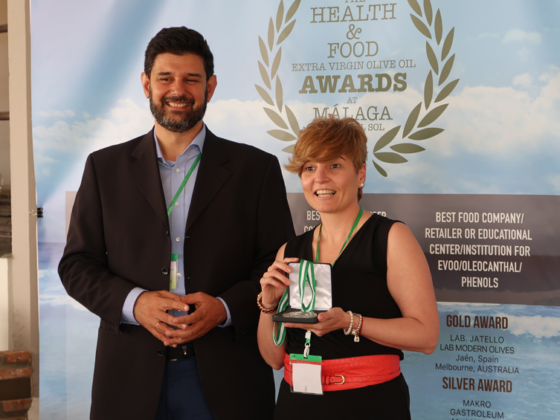 Are other phenolics in EVOO (e.g. oleacein [OA]) also NSAIDs? 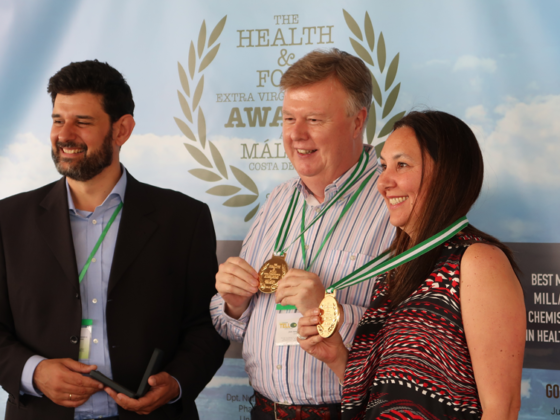 How are the apparent health effects of OC likely to differ from other EVOO phenolics? 3. 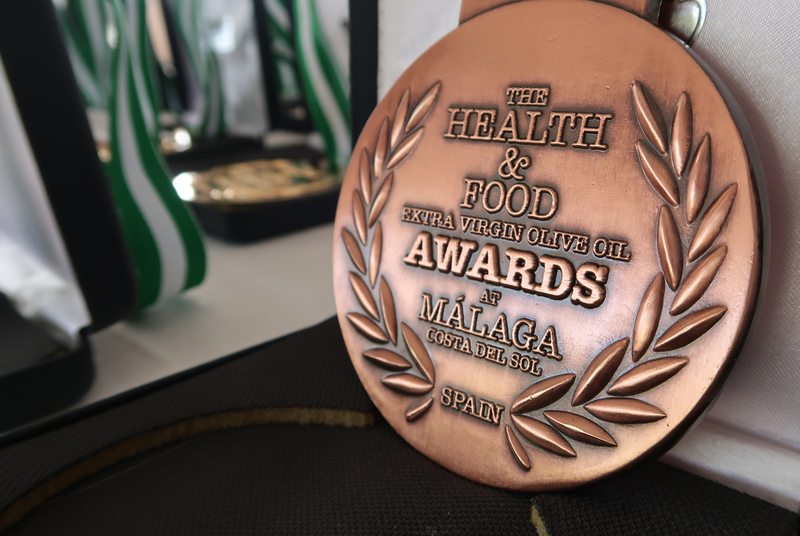 OC has been consumed in a remarkable food (olive oil) for thousands of years. So presumably it is safe and likely even healthy when consumed as a component of a Mediterranean diet. If we contemplate recommending consumption of OC outside food (e.g. as an OTC drug, perhaps in tablets) what research must be done to insure safety and efficacy? For example, should studies involving bioavailability, toxicity, and whole body efficacy be undertaken? And if so by whom? 4. OC is of apparent little interest to pharmaceutical companies likely because they cannot own the molecule itself. Thus research funding for important studies such as those mentioned above has been difficult to obtain. 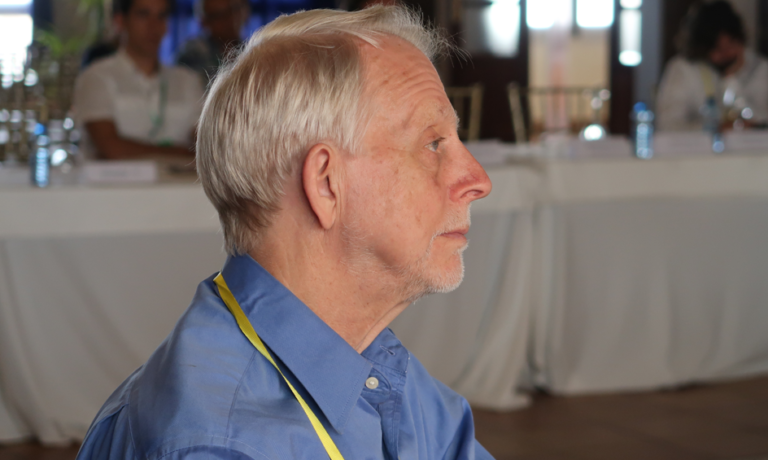 What should be done to insure funding for definitive studies? What kind of international cooperative activities might be proposed? 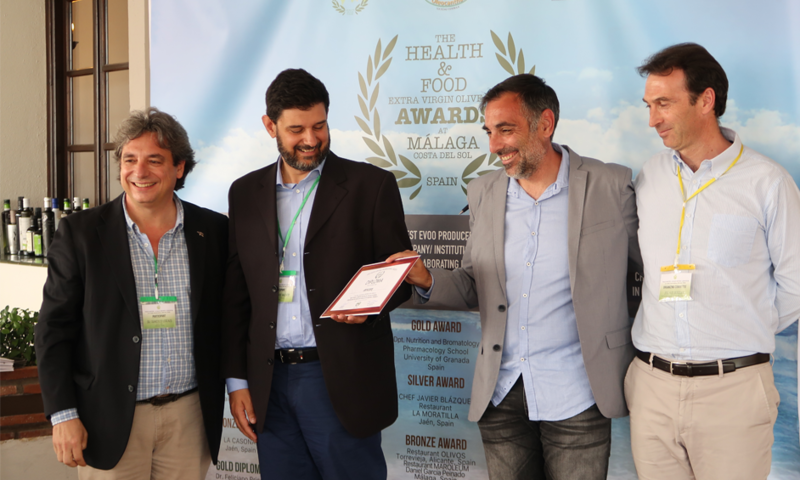 The second edition of the AWARDS HEALTH & FOOD (the first one was held in Olympia in 2016) took place at the Finca de los Caballeros in Benalmádena, putting the finishing touch to the IV Congress of the OIS. 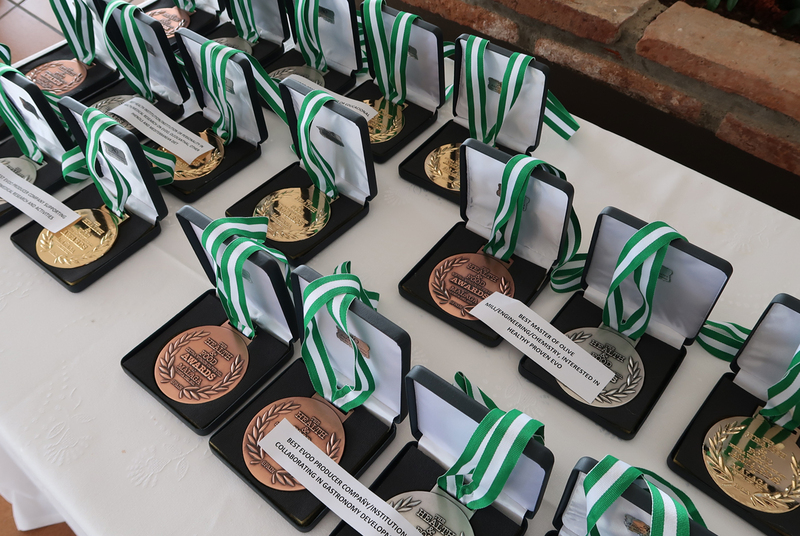 Eighteen Medals and 20 Diplomas in their three varieties of GOLD, SILVER and BRONZE were delivered by CHEF Maria Loi, Dr. Juan Tello, Dr.Ramon Estruch, Dr. Magiatis and Dr.Gary Beauchamp. MAROLEUM an innovative Restaurant run by a CHEF that participated from the beginning in the Oleocanthal Society, DANIEL GARCIA PEINADO. 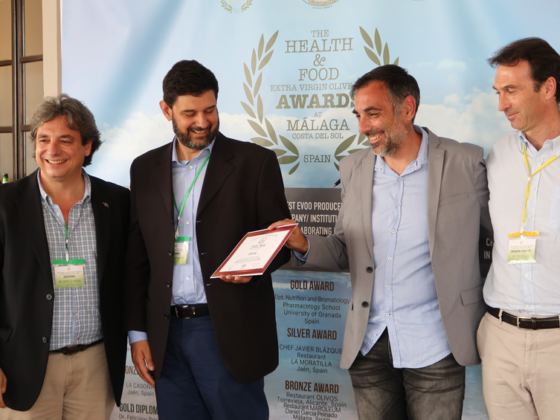 The culmination of the “HEALTH MATTERS CONVENTION”, was the inauguration of this Restaurant in the city of Malaga located next to the port in a place of high standing that augurs a great future. 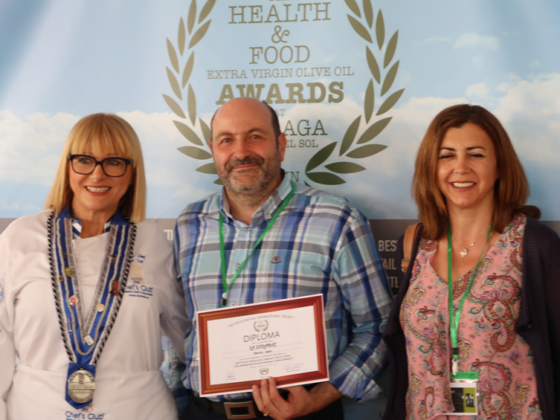 Its owner, the rusian company MILGA INTERNACIONAL CULINARIA from Olga Ivanova, welcomed the guests and dedicated words of praise to the CHEF Garcia Peinado and to Dr. Jose Amérigo, the latter as President of the Academy of International Cuisine with Extra Virgin Olive Oil. 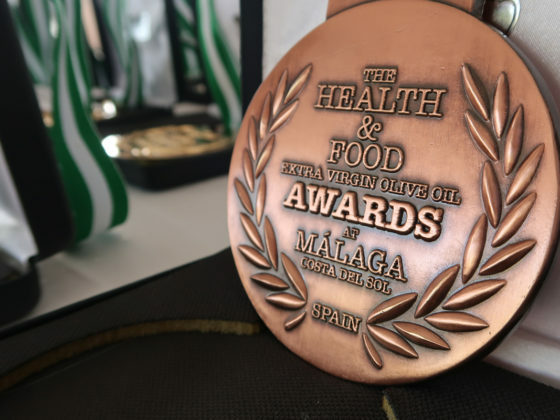 The restaurant ONLY COOK with EVOO and its specialties are based on the different EVOO from around the world, something that does not exist in any city in the world.